2017 Father Judge graduate Marc Rodriguez is continuing his hot streak at ESU. If you saw him in high school, you knew Marc Rodriguez was always comfortable taking a jump shot. The 2017 Father Judge High School grad always looked like he knew exactly what he was doing on the court, even during his freshman year when he was a member of the Crusaders’ varsity team. Rodriguez could do it all. But when he arrived at East Stroudsburg University last fall, Rodriguez wasn’t 100 percent comfortable. 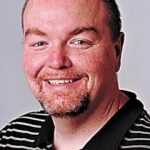 His role on the his college team was much different than his role at Judge, and the way the Warriors played was vastly different than he was used to playing under Crusaders coach Sean Tait. 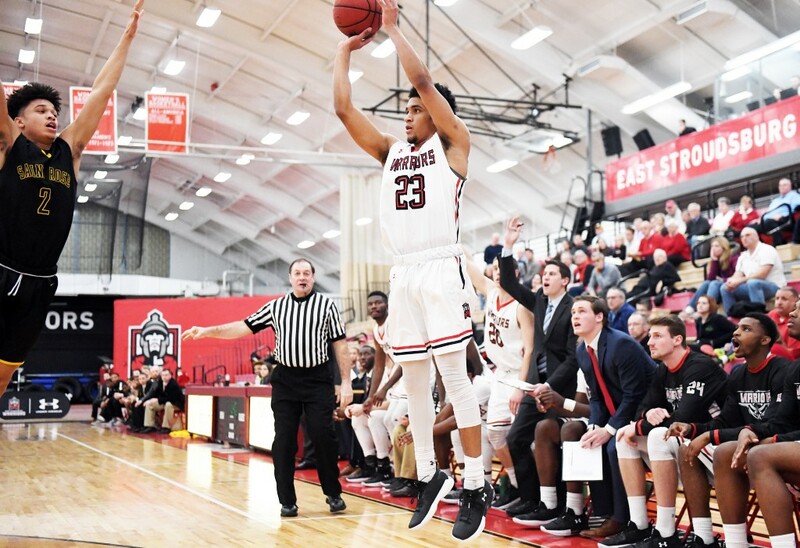 “Coming to East Stroudsburg definitely took me out of my comfort zone,” said Rodriguez, who was the first 1,000-point scorer in Father Judge history. “The biggest thing was in college, we would rotate after about four minutes, and I wasn’t used to that in high school. And we press all the time. Because of the changes, it took Rodriguez some time to get acclimated to the Warriors’ way of doing things. It also took some getting used to coming off the bench instead of playing every critical minute of the game like he did when he was wearing baby blue. But whatever his role was, Rodriguez did it and did it to the best of his ability. Instead of being upset at his playing time, Rodriguez did what he did his entire basketball career, he worked harder to get better. The freshman scored 6.3 points per game while playing an average of a little more than 17 minutes per game. He also continued his great long-distance shooting, knocking down 56 3-point shots, which was a record for East Stroudsburg freshmen, while helping the school finish 27–6, including the school’s first ever Division II Atlantic Region championship. He also was at his best when the season ended, hitting double figures in the Warriors’ final eight games. The harder he worked, the better he got. And that’s exactly what he’s doing this summer. Since Rodriguez is two hours away during the school year, he is soaking up as much time with his family and friends as possible. But he’s also spending every day in the gym. To get better, Rodriguez has found the perfect person to work out with. All summer, he’s been spending time in the gym with Archbishop Ryan grad and now Penn State guard Izaiah Brockington. The two had legendary battles during their days in high school, but even when they were doing their best to beat each other, they were close friends. That friendship continues as they push each other to improve. Rodriguez is always looking for improvement, and while his basketball game certainly grew as the year went on, it pales in comparison to what he did in the classroom. He had a good first semester, and even though he was doing fine, he worked even harder during the spring and was rewarded with better grades. Once his playing days are over, Rodriguez hopes to catch on with a team as a strength and conditioning coach. But before he hangs up the sneakers, he hopes to get his degree from East Stroudsburg and then possibly make some money from his jumpshot. Even if it’s out of his comfort zone.